I can't wait to meet my son and feel even more motherly because it will be a lot more real then, obviously. For Mother's Day, Kevin and I slept in, had breakfast, and then Kevin gave me a pedicure. It was the cutest thing ever, haha. The last time I painted my toes I mentioned it was getting harder and more uncomfortable since your belly is in the way and just doesn't feel as good bending over anymore, so he said next time he would paint them, which he did! He tried so hard...to take off my existing toe nail polish, to paint perfectly on my toes and that included every layer - base, color, and top coat. Oh and he gave me a foot massage which I think was one of my favorite parts. I love foot massages! We then got ready for church and headed over to my parents since Kelsi (my sister on a mission in Sao Paulo, Brazil) was calling within a 2 hour window on Skype! She finally called and we all got to talk to her for around an hour. She is doing well and will be coming back from her mission on July 19th of this year! Crazy thing is, that is her birthday! What are the chances of that?! It was good to talk to her, although the connection was a little bit bad, and crazy to think we'll see her soon. I'm sure she will be shocked at how huge I am haha. Then my parents gave me my first Mother's Day gift! They got a Mombo nursing pillow with cover. 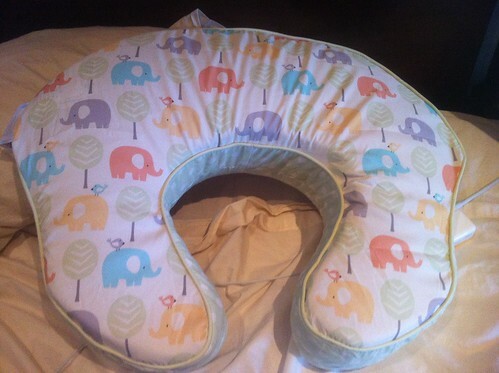 It is basically like the Boppy but it is newer and has one side that is soft and the other side is harder. You put the baby on a certain side depending if you want them to get sleepy or not. It also has a vibrating thing you can put in there which helps with certain things that I read online but have now forgotten haha. Other than nursing your baby can practice sitting up in it, etc. Then Kevin and I went to church and then came back to my parents for dinner. And my mom took this picture of me to send to Kelsi...lol. I'm 24 weeks, 6 days prego here. And here is our yummy dinner. 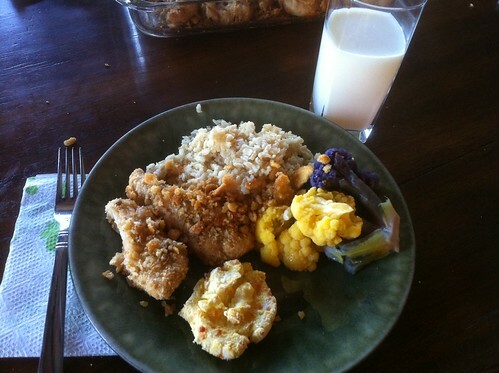 Ritz chicken (which I love and probably should learn to cook haha), broccoli, rice, and those Brazilian cheese balls like from Rodizios or Tucanos! My dad made them in honor of Kelsi being in Brazil haha. They are SO good! I had a wonderful Mother's Day! You are looking so cute Ashley! I've been gone for so long and though I knew you were pregnant it's so crazy to see how time has flown by and now you DO look it. Happy to know you had a great mother's day. Looks like the perfect day!! 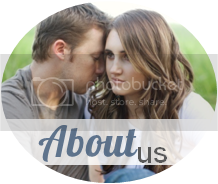 Hubby is so sweet! It's so nice! How sweet your hub!! you are so precious! 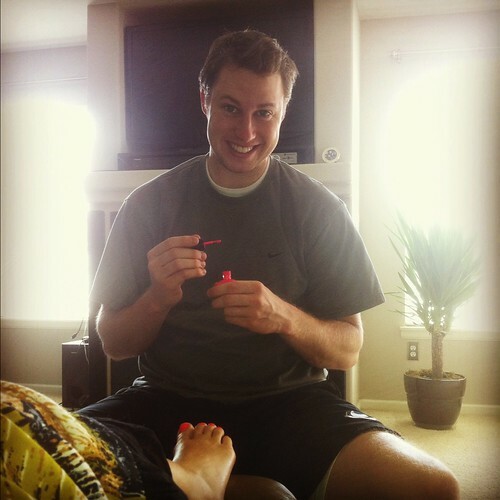 and what a husband, painting your nails! 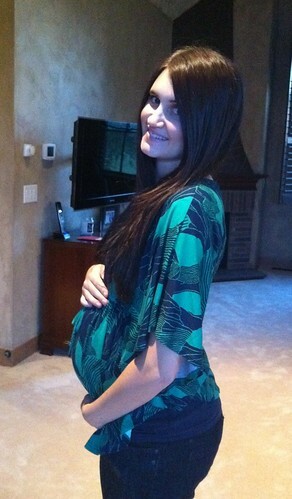 i hadn't heard of mombo before but i will have to keep that in mind when i am pregnant someday!